The rollers that I removed from my sliding screen door are ALMOST exactly what you see in the picture I've included. 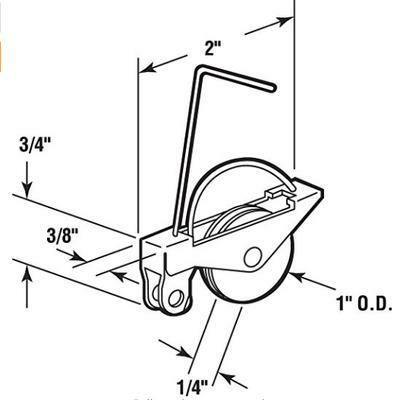 In the picture, you'll notice that the frame that holds the actual roller wheel is 3/8" wide. All the replacements I've found at every store I can find locally, indeed, measure 3/8". THE PROBLEM: The original rollers from my door are between 1/16" and 1/8" thinner. Therefore, the typical 3/8" wide replacements get stuck in the door frame and don't expand outward to create proper tension (basically, the door wants to fall out of the frame). Have you ever run into this yourself? Is there a source you know of that sells slightly different replacement rollers? I am thinking about doing a work around if I can't purchase what's needed. Thanks for posting the picture, I call that an MRSA roller but its made and used by dozens of companies across North America. The diameter of the roller varies but not usually the housing width. The sample I have measured 0.386 inches, just slightly more than 3/8 inch wide. The screen door roller kit I sell to replace the MRSA measures 0.360 inch wide which is less than 3/8 inch, so it should work better for you. The only issue is that you would have to pull all the old corners out and replace them with mine.